What are Shrink Printed Labels? Also known as shrink sleeve labels, shrink printed labels are one of the most popular types of printed labels on the market within the food and beverage industry. In our article Types of Printed Labels we mentioned that shrink printed labels “shrink” or mould to the products form, creating a durable and eye-catching 306 degree product label. This means that they do not use an adhesive to stick to the bottle but rather wrap themselves around the product when heat is applied. Examples include drinking yoghurt bottles, energy drink bottles, ice tea bottles. Also known as shrink sleeve labels, shrink printed labels are one of the most popular types of printed labels on the market within the food and beverage industry. In our article Types of Printed Labels we mentioned that shrink printed labels “shrink” or mould to the products form, creating a durable and eye-catching 306 degree product label. This means that they do not use an adhesive to stick to the bottle but rather wrap themselves around the product when heat is applied. Examples include drinking yoghurt bottles, energy drink bottles, ice tea bottles. How are shrink printed labels made? 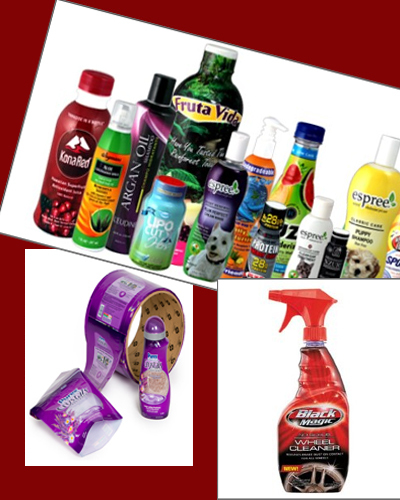 Shrink printed labels go through a variety of processes before they are applied or shrunk to the product. The material used is very thin, so it is important to get the correct web tensions without snapping or creating tears in the film. The smooth surface of the material also makes it harder for a dye or ink to stick to and therefore has to be done extremely carefully. In effect, the material goes through the following stages; it is first primed, it then goes through a pre-press (preparation of material) once that is done, the printing and varnishing of the actual label takes place. Once printed the label is cut to size in order to create uniform edges (slitting), centre sealing then takes place so that the label is now in the correct shape to slide over the bottle, again the printed label is cut to length. Once this is done it is slid over the bottle or container and finally heat shrinking is applied to the printed label in order to create the finished product. As there are so many different products that shrink printed labels can be used for, there are a number of different types of shrink printed labels. These include full body shrink printed labels, preform shrink printed labels, tamper evident bands and combination packaging.